This van has been parked in the “guest” (overflow) parking lot of our co-operative residential building for the last week or so. I assumed someone had bought it used at a severe discount because of the embarrassing logo, emblazoned on both sides of the vehicle. How wrong I was. 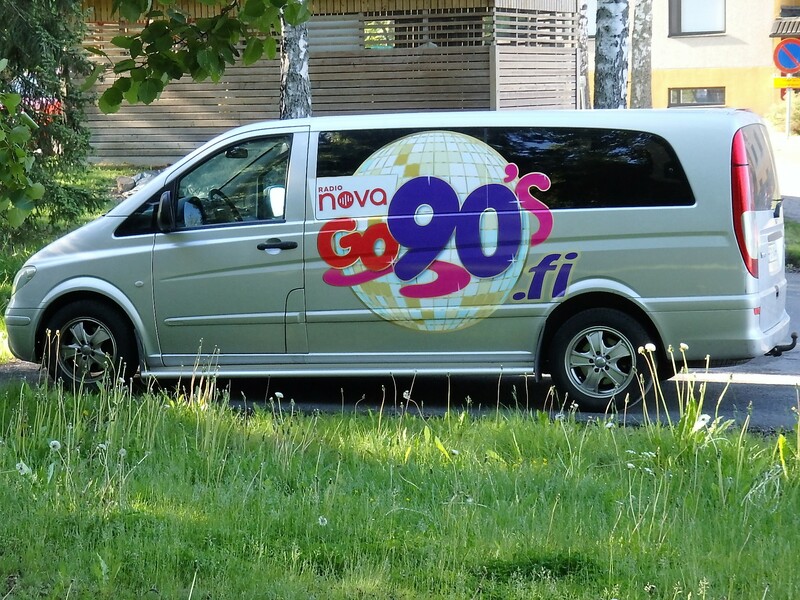 A quick check of Radio Nova’s website revealed that the station’s “Retroperjantai” (“Retro Fridays”) program and the unpatriotically dubbed Go 90’s festival are planning to make life in Imatra’s Mansikkala district unbearable on June 30 and July 1. These bastards (there is no other word for it) are once again going to rip up the lovely green meadow in the park along the Vuoksi River between the city hall-central library-cultural center campus and the swimming pool so the sagging waistlines crowd can listen to and gaze at the unmissed Raptori for something like 40 euros for a single ticket. 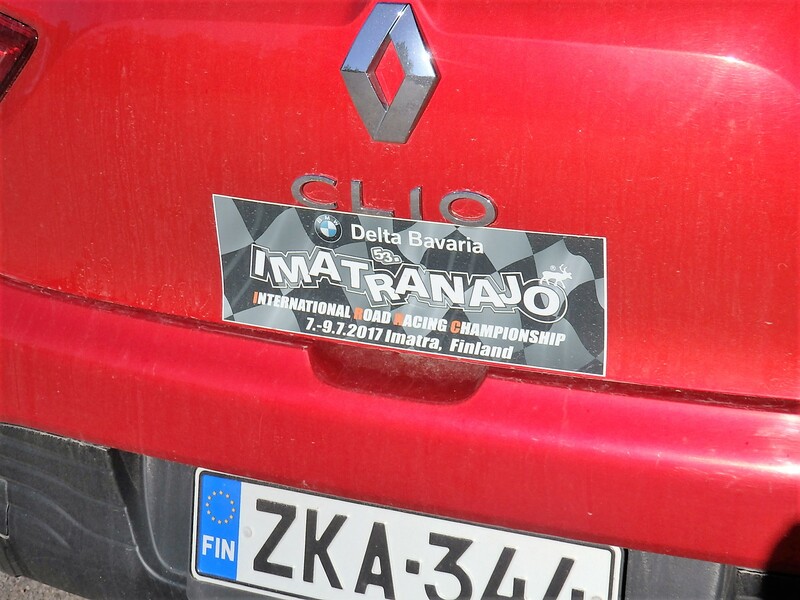 The cultural powers that be ripped up and fenced off the same meadow at least once or twice last summer for commercial music events, including concerts held in connection with the retrograde celebration of noise and air pollution known as the Imatranajo International Road Racing Championship. This motorcycle race had also quietly disappeared into the semi-distant past, but now it has been revived on a permanent basis by the city council and cycling enthusiasts. The renaissance coincided more or less with the extinction of the much more environmentally friendly and once-mighty Imatra Big Band Festival and the altogether environmentally friendly and utterly prestigious International Summer School for Semiotic and Structural Studies. The big band festival had real financial problems, apparently, but the city council, dominated by so-called Social Democrats and members of the now officially fascist Finns Party, chose not to save the world-renowned festival, so it sank and drowned altogether, while the International Semiotics Institute, housed in modest digs at the city library and funded by a tiny subsidy from the city, was banished from the city budget altogether (due its utter obscurity to the “proletariat,” one has to imagine, although it had existed happily in Imatra since 1988), forcing it to decamp to Budapest, if I’m not mistaken. 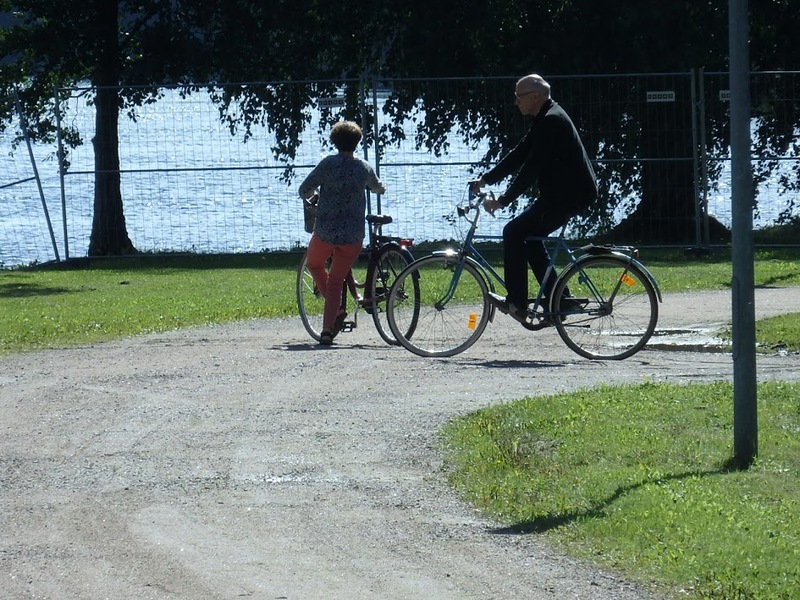 Eager to ensure that no one could enjoy the non-music on offer for free, the organizers of last year’s concerts in the park fenced off the bike and pedestrian path on the shore of the Vuoksi. I was lucky enough, if you can all it that, to get a snapshot of two worthy local oldsters who were literally baffled by this fence as they tried to cruise down the path along the river, probably the most beloved place in the city for riding bikes, jogging, and strolling. The old people were ultimately forced to turn around and either bypass the entire area or go back home. In the event, however, the music was loud as hell and echoed off and among the tower blocks situated right across the most heavily populated neighborhood in Imatra, Linnala/Mansikkala. The funny thing is that back in the wild days before the city fathers and mothers came to their senses and turned this stretch of the Vuoksi into a mecca for decorous recreation, wise urban administration, and the quiet pursuit of knowledge and culture, the so-called Virranpuisto (“Current Park”: I’ve never heard this toponym before or seen it on any map) was the city’s official camping grounds. The wild days in question were the sixties and seventies. I’ve seen photos of what the Tainionkoski camping grounds looked like back then, and I’m truly glad I had a whole ocean between me and that silly trash- and car-infested mess, dotted with tents, in its heyday. So it would seem that, on the strength of the false urban planning and administration theory that every largish plot of urban greenery that isn’t generating income either for local councils or local developers (or both), has to be bludgeoned into cashcowdom, however badly that impacts the quality of life of the folks who actually live in the neighborhood, we are returning not only to the nineties but also to the seventies, when the meadow was a swamp of human congestion and consumption every summer. More or less kittywampus from the newly minted funfair known to boosters (but not to actual people) as Virranpuisto is the scandalously underused Imatrakosken Urheilukenttä (“Imatrankoski Athletic Field”), where, I’ve noticed, traveling circuses set up camp and perform for a few days every summer. The athletic field has the facilities and space for such entertainments, and it is located in a much less populous neighborhood. Why not relive the nineties there? UPDATE. My best friend, whose memory is much better than mine, points out it was the Finnish federales who axed the ISI’s extremely tiny budget, not the lowly Imatra city council. I seem to remember the ISI then appealed to the city council for funding, but was turned down. My best friend remembers no such thing.